Please welcome our newest Supporting Vendor - John-AnalogCarcom! Last edited by rob the elder; 11-01-2018 at 06:24 AM. A silver convertible? I may have to buy one of these! These shirts are printed on the highest quality soft cotton shirts and they hold up well. The long sleeves and hoodies are quality as well but they are a 50/50 blend material for warmth. Please let me know if you have questions or suggestions for future shirt designs. I am the artist so I want to know what you want. Keep up the good work !what I have seen so car looks good ! Perhaps offer text ax well. 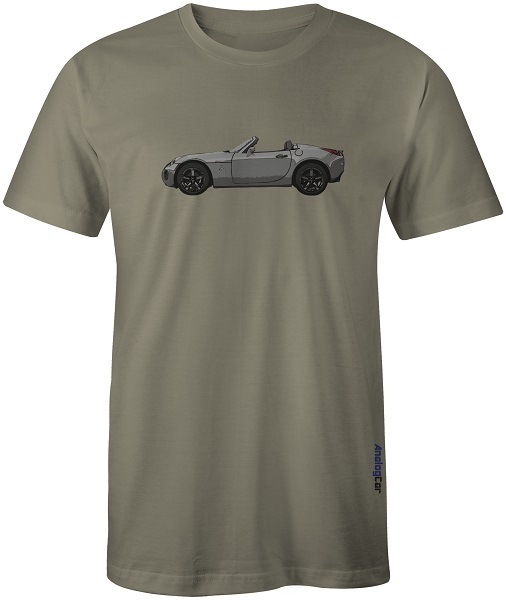 I have a shirt with on the back a drawing of my roadster on it with the text The Red One under it and on the front top-left a small red chiefs head. Is time to replace that one, so I will definitely be in the market for a Red Solstice with Chrome wheels !